WACO, Texas (AP) — Fourth-ranked Baylor was just fine without its All-America post player against overmatched Southern University. Honesty Scott-Grayson scored 15 points on 6-of-7 shooting to lead four freshmen and seven Lady Bears overall in double figures as they got past Southern University 94-49 on Thursday night, a day after 6-foot-7 post Kalani Brown sprained her ankle in practice. “She rolled it on somebody’s foot. 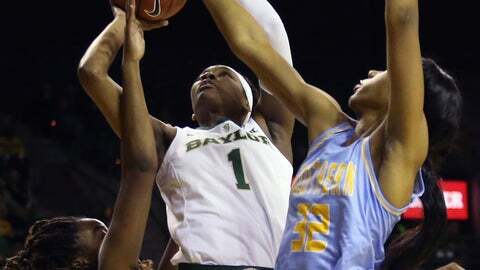 No need to play her tonight,” coach Kim Mulkey said. Brown was in uniform if needed, but that wasn’t necessary. The senior ended her streak of 113 consecutive games and 64 starts in a row. Baylor (4-0) led throughout, and was already up 28-7 late in the first quarter after a 20-3 spurt when seven different players combined on the nine baskets in that span of less than five minutes. Moon Ursin, Queen Egbo, NaLyssa Smith, Chloe Jackson and Caitlin Bickle all had 11 points for the Lady Bears, while Lauren Cox scored 10 points and blocked five shots. Egbo, Smith and Bickle are all freshmen like Scott-Grayson. Jackson, the graduate transfer from LSU, had eight assists. Courtney Parsons had 11 points for Southern (2-2), which was outrebounded 42-24 and outscored 38-15 in the paint. The Lady Bears shot 75 percent (24 of 32) before halftime, when they led 59-27. Southern has won its two games against lower-division teams — a Division III and an NAIA team. But the Jaguars have had lopsided losses to major conference teams. They lost 89-58 at Kentucky. Baylor has won it three home games by an average margin of nearly 55 points and averaged just under 103 points in those games. It was the second time this season that the Lady Bears matched a team record with seven players scoring in double figures. Southern senior post Sarai Blissett was ejected midway through the third quarter when officials reviewed courtside video monitors after she was initially called for her fourth foul. Southern plays its next two games at home, Monday against South Alabama and then Nov. 29 vs. Dillard. Baylor, which doesn’t play at home again until Dec. 12, will be in Las Vegas to play in a tournament after Thanksgiving. The Lady Bears play Nov. 23 against South Dakota State.